“It is a very populous city, so that one can scarcely pass along its streets, on account of the throng. The inhabitants are magnificently apparelled, and are extremely proud and overbearing: and because the greater part, especially the trades people, seldom go into other countries, but always remain … in the city attending to their business, they care little for foreigners, but scoff and laugh at them; and … one dare not oppose them, else the street-boys and apprentices collect together … and strike … unmercifully without regard to person; and because they are the strongest, one is obliged to put up with the insult as well as the injury. The women have much more liberty than perhaps in any other place; they also know well how to make use of it, for they go dressed … in exceedingly fine clothes, and give all attention to their ruffs and stuffs … whilst at home perhaps they have not a piece of dry bread”. During his visit to England in 1592, Frederick made representations to Queen Elizabeth to be made a Knight of the Garter, contrary to diplomatic protocol. 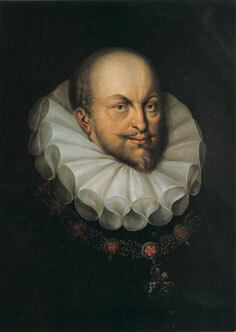 He was eventually admitted to the Order after being made Duke of Wurttemberg in 1597, but in a perceived deliberate slight was not informed of his admission until it was too late for him to attend in person the investiture. His absence from the investiture was the subject of a joke at his expense in Shakespeare’s “The Merry Wives of Windsor”, which was written for the event. This entry was posted in 16th century London, Contemporary accounts of events, Shakespeare, Tudor and tagged Queen Elizabeth I, The Merry Wives of Windsor on August 10, 2014 by Bob Jones - The Lost City of London.